Sri Lanka 336 and 2-65 (Dimuth 30, Kumar Sangakkara 18*, Shane Watson 1-10) trail Australia 5-450 and 278 (David Warner 68, Michael Clarke 57, Ed Cowan 56, Rangana Herath 5-96) by 328 runs. Australia came back in the match by removing the openers of Sri Lanka and the home side looks for a victory after setting a mammoth target for the visitors. The Kangaroos declared their first innings after hammering 450 runs for the loss of five wickets and were bowled out for 278 in the second. The Lankan Lions were restricted to 336 in the first innings and got in trouble by losing two wickets after scoring 65 runs in their second innings. 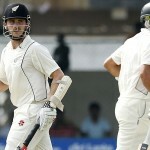 The fourth day of the Test finished on Monday, December 17, 2012, at Bellerive Oval, Hobart. Earlier, Australia started the day at 27 for no loss after 14 overs, Ed Cowan was playing on 16 along with David Warner who was batting for 8 runs. Warner initiated the day well by getting two fours until the 19th over as Cowan hit a couple of fours in the following over. The pair kept on moving the score board at a nice pace and the first hundred of the innings was attained in the 35th over. David Warner was the first to score his third Test fifty on the first ball of the 37th over with a four and dispatched the first six of the innings in the next over. Ed Cowan joined his partner and achieved his fifth Test half century in the 39th over by hitting a four on the last ball of the 39th over. 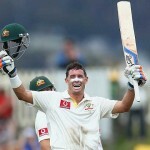 The visitors got the first breakthrough when David Warner was gone for 68 as the score reached 132 runs. Ed Cowan was clean bowled by Chanaka Welegedara after the addition of eight runs to the total at his personal contribution of 56. The Islanders came back in the series as Rangana Herath bowled excellently and the home side lost its fifth wicket at 5-181 in 57.4 overs. The experienced duo of Michael Clarke and Michael Hussey got together in the park and stopped the invasion of the rival bowlers. The Australia skipper, Michael Clarke started playing his shots and the second hundred of the innings appeared on board with a boundary from him. 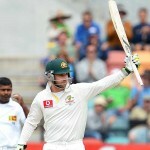 Clarke accumulated 11 runs in the 66th over with 1 six and 1 four and scored his 24th Test fifty in the next over. He walked off the field due to a right hamstring problem at the end of that over and Peter Siddle replaced him. Michael Hussey hit a six on the first ball of the following over as the latter lost his wicket for four runs in the 69th over. Hussy held his end as the wickets started crumbling from the other end at regular intervals. He remained unbeaten for 31 as the Australian innings was folded back at 278 in 73.5 overs. 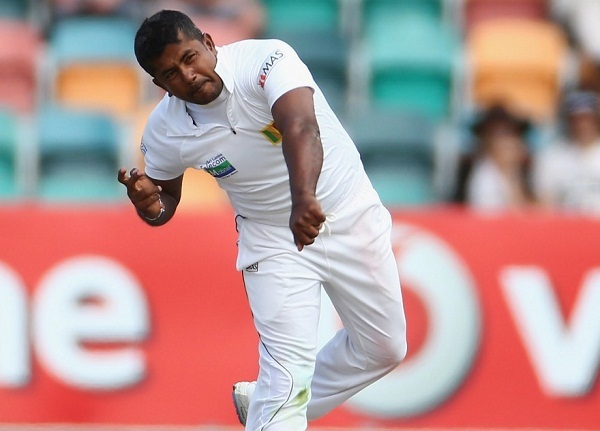 Rangana Herath came into his own by grabbing five wickets, Chanaka Welegedara held three whereas Shaminda Eranga got one wicket. Sri Lanka went off to a rising start of their second innings and scored 24 runs after six overs by the openers Dimuth Karunaratne and Tillakaratne Dilshan. Dilshan became the first victim when he was caught behind by Matthew Wade off Shane Watson for 11 as Kumar Sangakkara took guards at the crease. Sangakkara got a life when he was dropped by Michael Clarke off Nathan Lyon on the third ball of the 17th over at three runs. Both batsmen kept on crawling and took the score to 47 in 23 overs as the stumps of Dimuth Karunaratne were dislodged by Mitchell Starc for 30 off 81 balls with 3 fours. The skipper of Sri Lanka, Mahela Jayawardene, joined in with Sangakkara and they did not take any chances against the accurate bowling of Australia. Quite a few overs ended up as maiden and the visitors managed 65 without losing any further wicket after using 37 overs. Kumar Sangakkara faced 88 balls for his 18 as Mahela Jayawardene defended 37 deliveries for his five runs. Sri Lanka still requires a huge score of 328 runs and Australia needs another eight wickets to win the match and at the moment the balance of the match has tilted in favour of the hosts.